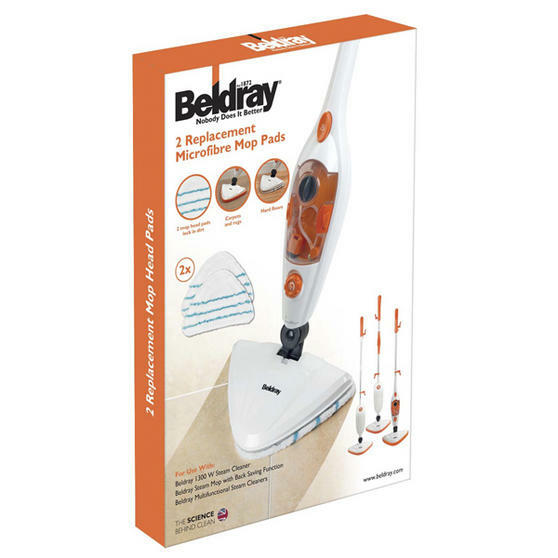 Keep your Beldray mop working at its best by replacing the mop head pad every so often – or after an especially tough clean. Measuring 1.8l x 20w x 32h cm, they are suitable for use with the 1300W Steam Cleaner, Steam Mop with Back Saving Function and Multifunctional Steam Cleaners – models BEL0200, BEL0196, BEL0182, BEL0285, BEL0287 and BEL0289. Made from soft polyester, these durable microfibre mop pads lock in dirt so you can clean efficiently and hygienically on any floor. These mop pads are for use with the following Beldray steam cleaners and mops; BEL0200, BEL0196, BEL0182, BEL0285, BEL0287, BEL0289.